Since it was introduced, the Marlow Explorer 66E has captured the hearts of the new owners, owners in waiting and those with a wish list. In her continuing success, this remarkable yacht is turning heads with her sleek contoured lines and exciting new features and layout. From the radar array to the strut keels, this new Marlow Explorer 66E has been designed with all of our hallmark features and has been loaded with enough new features to demand awe and praise from all who explore her. 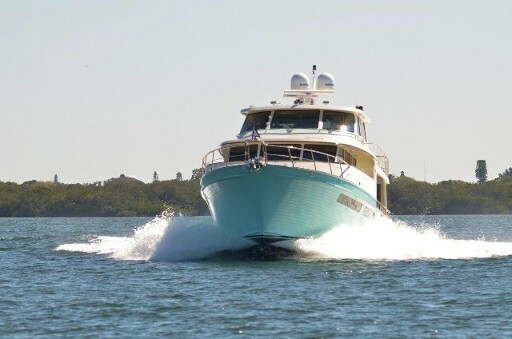 The newly designed cockpit features a radius transom with a center stairwell along with two built in corner settees with tables, greatly enhancing the social aspect of the aft deck when dining, enjoying cocktails and just hanging out. The wide stair down to the swim platform provides a safe passage and a great place to sit and watch the activities when at anchor. 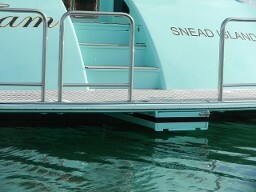 A beautifully hidden and articulate swim ladder provides easy egress from the water and the platform is a perfect landing for the dinghy and fishing. The contoured transom increases the stowage area in the lazarrette for tools, toys and equipment. Upon entering the salon, you immediately feel the warmth and coziness while noticing the expansiveness of the room with its finely crafted furnishings. Immediately inside the door to both port and starboard, are the wine cooler, ice maker and wet-bar with intricate curved glass cabinets allowing easy access from both inside and the aft deck. 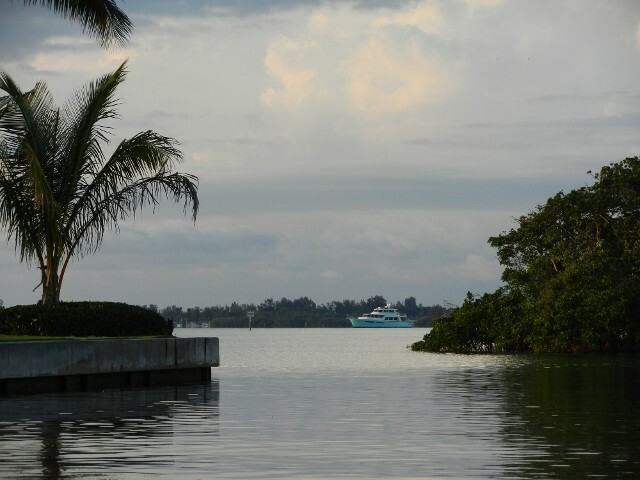 There is a long curved built-in sofa on starboard side and two comfortable lounge chairs on the port. The hidden television is midship and there is a desk with a printer station in the forward part of the salon starboard side. 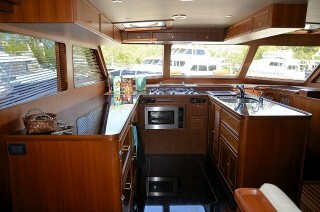 Up three steps is the spacious pilothouse area with a large U-shaped galley forward. This granite domain is bathed in natural light and the chef enjoys a 360 degree view of activities within and outside of the yacht. Ammenities include SubZero drawer refreigerators and freezers, Dacor cooktop, Franke sink, Grohe fixtures and our many built in storage conveniences. A very large dinnette faces forward for dining and lounging with a view. 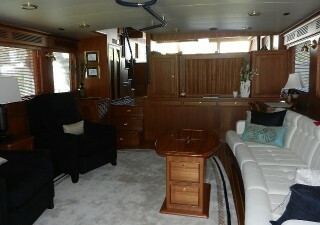 The companionway to the lower deck leads to a sunlit foyer-type area. At the foot of the stairs is a hidden laundry station with a stacked washer and dryer with easy access. There is a cozy bunk for daytime lounging, an extra grand child or for folding laundry with a large storage cabinet for cleaning supplies or extra linens below. 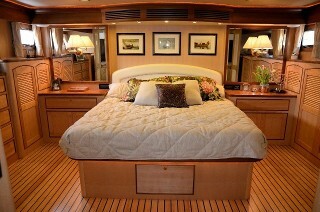 The VIP stateroom in the bow has an island queen sized bed with two upper bunks outboard. The ensuite head is ample and well appointed. The portside guest suite has twin bunks and a private head with full shower, cedar lined hanging lockers and ample drawer capacity. 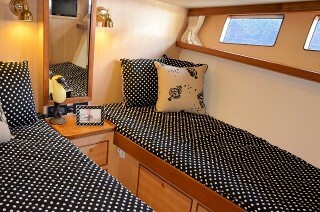 The master suite occupies the middle part of the yacht for least amount of motion and most comfort. As you enter through double arched doors the room opens into a spacious yet wonderfully cozy stateroom. The king bed is center with large bureaus and hanging lockers port and starboard. There are two complete his and hers heads with gleaming fixtures, frameless glass shower stalls and marble floors on eithr side of the entry forming a hall for separation even when the doors are open. The layout is brilliant.